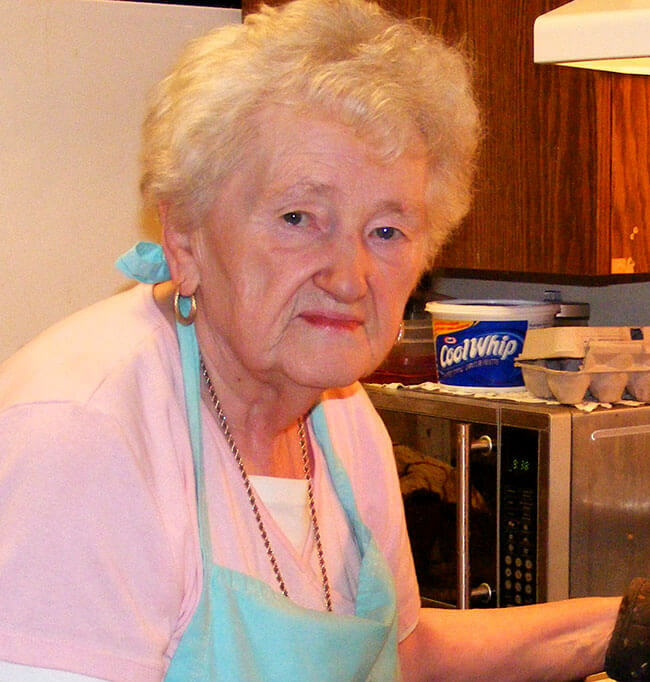 Frieda still makes quantities of traditional foods such as zwiebach (bread rolls), rollkuchen (fritters) and paska (Easter bread), as well as pies, cookies and squares, but her specialty is raisin bread. Whenever there is a funeral in her congregation, Leamington United Mennonite Church, she makes 25 loaves of raisin bread. In the fall of 2016 there were three funerals in 10 days, so she made 75 loaves. Although she uses a mixer to make zwiebach, she thinks the raisin bread turns out better if she kneads it by hand. As a member of the Auxiliary of Leamington Mennonite Home, Frieda bakes for its fundraising sales and other special events. At Christmastime she puts together trays of cookies, squares and raisin bread to give away, sharing with friends and the ministers at her church. Every weekday evening the residents of the apartments come together for tea in the common room, a ritual begun by Frieda and her friend Mary Rempel, and Frieda regularly bakes goodies for everyone to enjoy. The local historical society gathers every weekday morning for coffee, and Frieda provides baked goods for the members once a month. “I like sharing with others,” says Frieda. It is her way of giving to the community and making a contribution. She gives from a full heart and with a sense of thankfulness. Although she didn’t spend much time in the kitchen when she was young, she quickly learned to cook and bake when her children came along. In the early 1970s she ran a catering business, but when her 16-year-old son was hit by a drunk driver and permanently disabled, she could no longer continue. She coped with the tragedy by cooking and baking. Her son now lives in the long-term-care home where she can visit him every day. In 1994 Frieda put together a recipe collection. It was so popular it was re-issued a number of times, the last time in 2011. She also ran a bed and breakfast in her home until 2007, when she and her husband moved to the apartment. Although she only has a small kitchen, Frieda continues to turn out lots of wonderful baking. She has no trouble finding people who appreciate her generosity. Visit canadianmennonite.org/raisin-bread-recipe for her specialty dish and more about her recipe book.